Russia considers Sentsov and Kolchenko its own citizens. 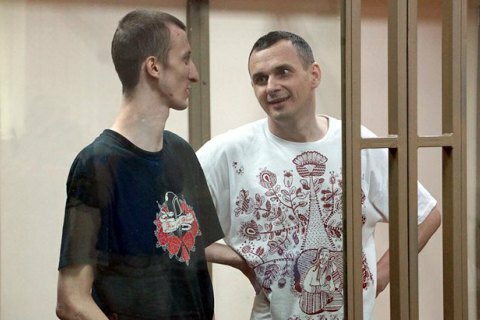 The Justice Ministry of Russia has again turned down Ukraine's request for the extradition of Ukrainian filmmaker Oleh Sentsov and Oleksandr Kolchenko to Ukraine. "Russia considers them its own citizens," the deputy justice minister for European Integration, Serhiy Petukhov, said on Facebook on 6 February. Petukhov published the Russian Foreign Ministry's response which says that the Russian Federation considers Sentsov and Kolchenko its citizens with permanent residence on the territory of the Russian Federation. In August 2015, Russia's Northern Caucasus District Military Court in Rostov-on-Don sentenced Sentsov, who was detained in Crimea in 2014, to 20 years in a high-security penal colony on charges of creating a terrorist organisation on the peninsula. Kolchenko was sentenced to 10 years in prison in the same case. In early May 2016, the convicts filled out documents for their extradition to Ukraine to serve their terms there. On 1 June, the Russian Supreme Court refused to consider an appeal against their sentences. On 21 October 2016, Petukhov said Russia had refused to extradite Sentsov and Kolchenko to their home country to serve their terms there.